A pathway to our perspectives, announcements, and the latest animal health and food safety news. This story originally appeared in Inquiry, a publication of the U's Office of the Vice President for Research. As the world’s population swells, fish hold great potential as a source of protein for sustainably meeting growing global food demands. For Chile—the world’s second largest producer of salmon, according to the industry association SalmonChile—fish are also a pillar of the economy and a key part of citizens’ livelihoods. In late March, University of Minnesota researchers met with partners in Chile to examine fishing industry practices that could help the country prepare for future food demand. The project is one of several research endeavors now taking off as a result of a network designed to form collaborations between U of M researchers and their Latin American counterparts around the goal of improving animal, human, and environmental health. This network, now in its second year, was launched through an International Capacity Building grant from the U’s Office of the Vice President for Research (OVPR) and matched by funds from the U’s Endowed Chair of Global Animal Health and Food Safety. The collaborations aim to secure grants in the fields of aquaculture (farming fish or shellfish for food), livestock health, zoonotic (animal-to-human) disease prevention, and ecosystem preservation—along with the areas where these four areas intersect. The idea behind the network is that collaborating with a major US research university can boost the appeal and credibility of research projects to Latin American funders and vice versa, said Andres Perez, Ph.D., director of the Center for Animal Health and Food Safety in the College of Veterinary Medicine and one of three principal investigators on the project. This advantage could help breed long-term collaborations that mutually benefit researchers at the U of M and in Latin America. The transdisciplinary effort brings together U of M researchers from the College of Food, Agricultural, and Natural Resource Sciences (CFANS); the School of Public Health (SPH); and the College of Veterinary Medicine, as well as the corresponding experts from these fields in Latin American research institutions. Alongside Perez, the principal investigators are Claudia Muñoz-Zanzi, Ph.D., associate professor of epidemiology and community health with SPH; and Nicholas Phelps, Ph.D., assistant professor of fisheries, wildlife and conservation biology in CFANS. Maria Sol Perez Aguirreburualde, Ph.D., the initiative’s project manager, manages the network and provides administrative support across research areas to help the collaborations succeed. Andres Perez, Ph.D., director of the Center for Animal Health and Food Safety in the College of Veterinary Medicine, presents on methods for modeling infectious diseases in aquaculture during a gathering of academic and industry experts in Chile. Photo: Amy Kinsley. Through their collaboration with Chilean researchers and industry experts, U researchers are working on a number of projects related to the prevention and control of diseases of salmon. One of the most important projects is a collaboration with the country’s Ministry of Economy, Development, and Tourism as well as industry and academic experts that studies how antibiotic use in salmon farming affects human health and the environment, and how farmers can reduce antibiotic use. 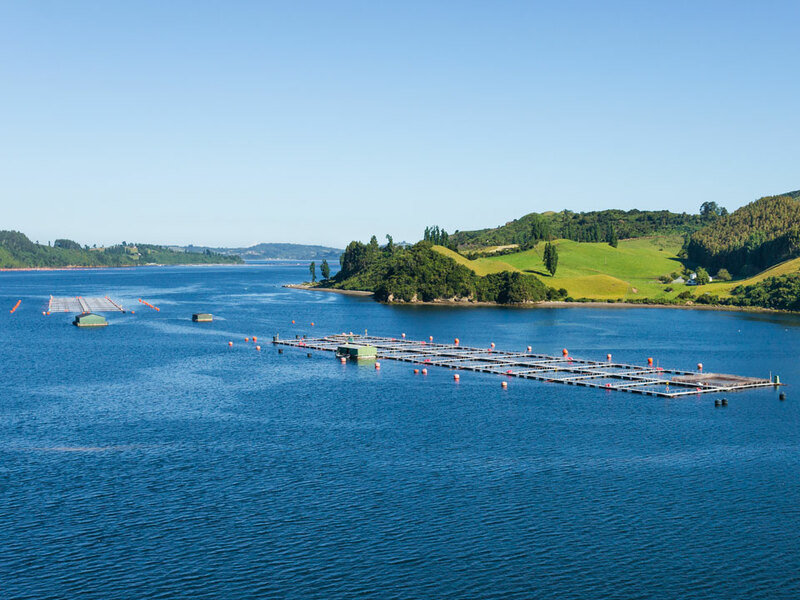 Salmon farmers treat their fish with antibiotics as a way to prevent losses from a potentially fatal, but common, bacterial disease called salmon rickettsial syndrome. But scientists worry that treating the salmon could, in the future, contribute to antibiotic-resistant bacteria, and that this resistance could transmit to bacteria involved in human diseases, making infections more difficult for doctors to treat. In addition to the collaboration with Chile, researchers have also made progress so far in Argentina, Peru, Spain (included for its cultural similarities to many Latin American countries), and Uruguay. Three of these countries—Argentina, Chile, and Peru—were identified as high-potential areas for new international research collaborations in a 2015 OVPR analysis. The collaborations behind the projects, apart from supporting research, have also boosted related efforts, such as ProgRESSVet, a capacity-building program for veterinary services in Latin America, and iCOMOS, the International Conference on One Medicine One Science. Ultimately, Perez said he would like to develop centers in collaborating countries that will help researchers continue to identify grants and opportunities there. “We are hoping to find ways of making this program sustainable beyond the life of the project,” he said. The Transmission is a compilation of current topics and news updates in animal health, food safety, and veterinary public health.